It was a dry wintry night and we brought over a thousand leaflets -- each with a poem to be completed -- to Tsim Shat Tsui and handed out more than half of our pile! We divided into small groups. Some of us were at the Harbour Promenade; some were around the water fountain in TST East, and my group of five was at the Park Lane Shopping Promenade by Nathan Road. We spent a good hour distributing our poem. Because the leaflets were of three different colours (green, blue, and orange), some people wondered if each colour contained a different poem! Just after 11:00pm, we gathered in an elevated urban park overlooking the Victoria Harbour and discussed our experience in this activity. We found that there were a lot of young couples on the street, and it seemed to us that men were more likely to receive our poem women. The people who actually received our gift were a small percentage. A lot people refused to take the paper. Some even walked further away from us to avoid the interaction! However, some of our members shared stories about people actually stopping on the street and asking about our group. We also agreed that it was a very good feeling to see a person taking a poem from us and reading it as they walked away. We also discovered different strategies in terms of execution. Someone suggested that it was good to approach people while they were stopping for a traffic light. I found that it was always good to make eye contact, smile, and greet the person as I reached out. What we say to the person in the interaction is also important. I prefered saying, "Here's a gift for you." Another person found it helpful to begin with an invitation, "Would you like to try writing a poem?" I think it's always better to say something. In the end, we agreed that the purpose of the activity is not so much to 'advertise' for our poetry club. But more importantly, we all got an experience of what it is like to interact with strangers passing by on a busy street. We felt this was a comfortable activity because we were not selling something. We only wanted to share with them what we enjoy, and hopefully bring some joy and facilitate some deep thoughts and an appreciation for words and poetry in the process. This group has a total different dynamic from group 1 because it consists of secondary students. A few students of mine came to join this fun activity after a celebration dinner. 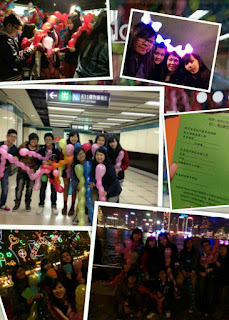 Along the way, we passed K11 shopping wall and each of them tagged along with some colourful balloons. Everyone was growing with vitality and happiness on their faces. We collected the poem leaflets from Adam. Before setting off, we took a photo in front of the Christmas tree in the hotel of Shangri-la. This marked a good beginning. We split ourselves into two sub-groups. Our distribution spots were the coastal area from TST East towards TST. Our targets were local people, overseas visitors and visitors from Mainland China. Many of which were couples or family with children. Owing to the colourful balloons, most people mistook us as balloon-hawkers. "Some people approached me asking me the price of the balloon." A student recalled. "Some people speak English to me. Luckily my English is not bad and I returned him Welcome to Hong Kong." Another one shared his experience. This was a fresh new experience for the students. They have never had the experience of distributing poem leaflets in an open space facing so many strangers. But they were not shy. They were active and keen to complete the task at their best effort despite the breezy cold weather. From the observation, it was more likely children taking the leaflets than adults. We bought a Minnie shinning head accessory on our head later on. With this special visual effect, more people were willing to receive the leaflets. Students did not care whether it is a commercial leaflet or a poem leaflet. But they did care if this is an effective approach. One student suggested us to give out free tissue packs. "In my experience, if people distribute leaflets in the street with tissue pack, I will not turn away. Try it next time. I am sure everyone is willing to take it." What an interesting suggestion! We had done it for around an hour. Students were claiming they had never been so tired before. We gathered together to share the experience before we were heading home. 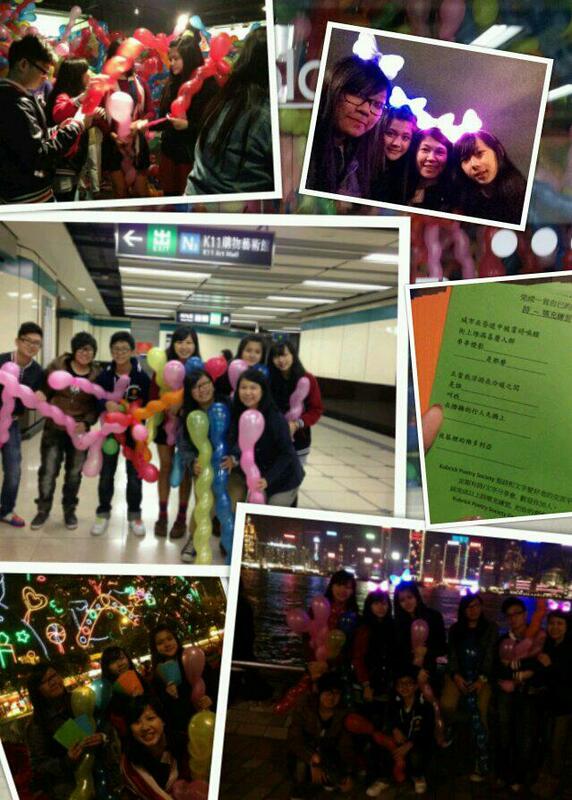 On this night, we went home with a glimmering smile, a warm heart and a balloon.